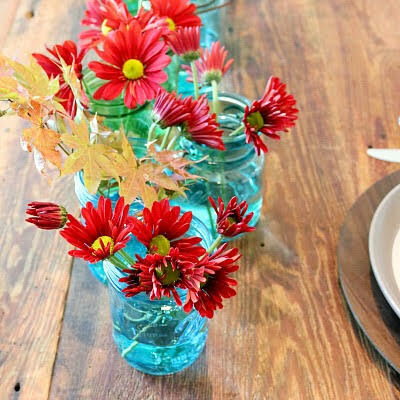 I have such a simple diy for you to make for your Thanksgiving table! Each Thanksgiving I try to come up with ways to get everyone around our table to think about how blessed we are and contemplate on being thankful. This year I’ve made simple place cards with the word “THANKFUL” written on it and spaces for each person to fill in what they are thankful for! Simple and hopefully thoughtful! Here’s a free printable for your table too! Today is 10 MINUTE DECORATING… The Thanksgiving Edition! Make sure to stop and visit my friend’s blogs at the bottom of this post! 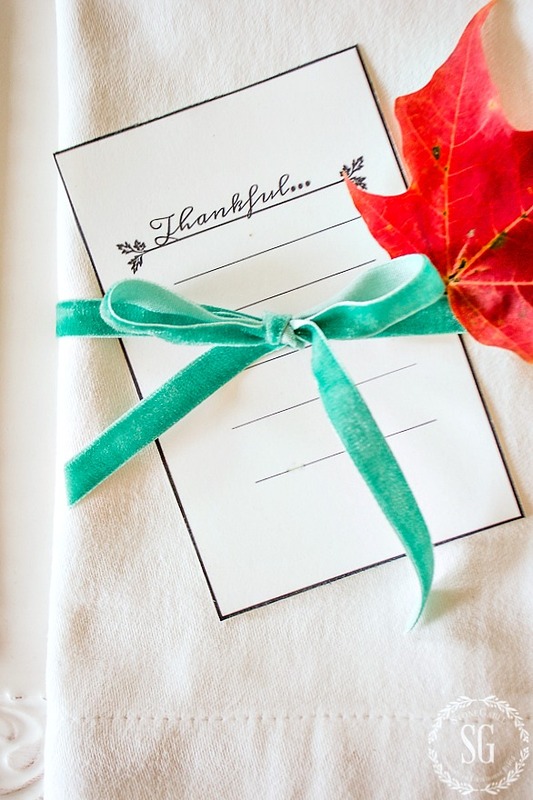 I put the little “Thankful” card on top of a white napkin and tied it up with an aqua velvet ribbon. Easy peasy! 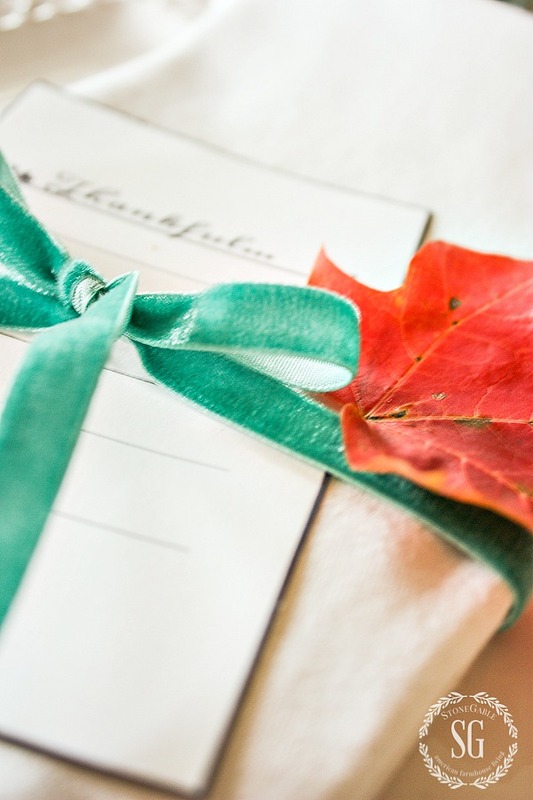 I was going to tie up a sprig of rosemary or a feather with the place card, but our sugar maple leaves are beautifully saturated with color right now so I added a leaf instead. 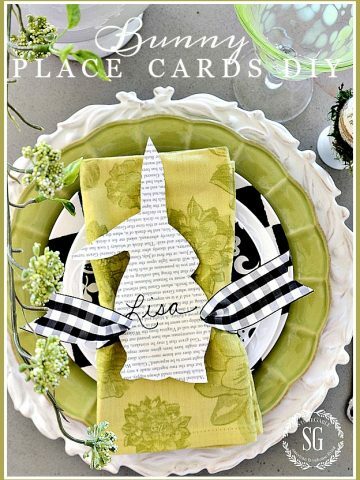 I think this “Thankful” place card is such a sweet reminder of how blessed we are! 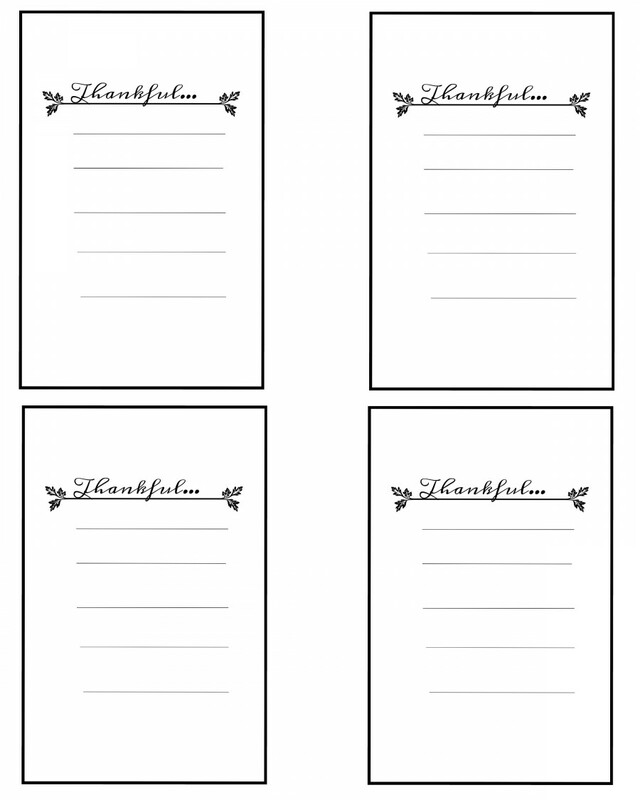 To get a free “THANKFUL” printable like the one below click HERE. You might like to follow me on Pinterest and see all the amazing things I’m finding to pin every day HERE. Check out what 10 MINUTE DECORATING ideas these talented bloggers have crated for you! I have not been receiving emails for about a week. When trying to update my email, the message was that I was already a subscriber. HI CAROL! Look in your junk mail and if StoneGable’s newsletters are the move one to your inbox and they will start coming there. If that does not work, unsubscribe and subscribe again. 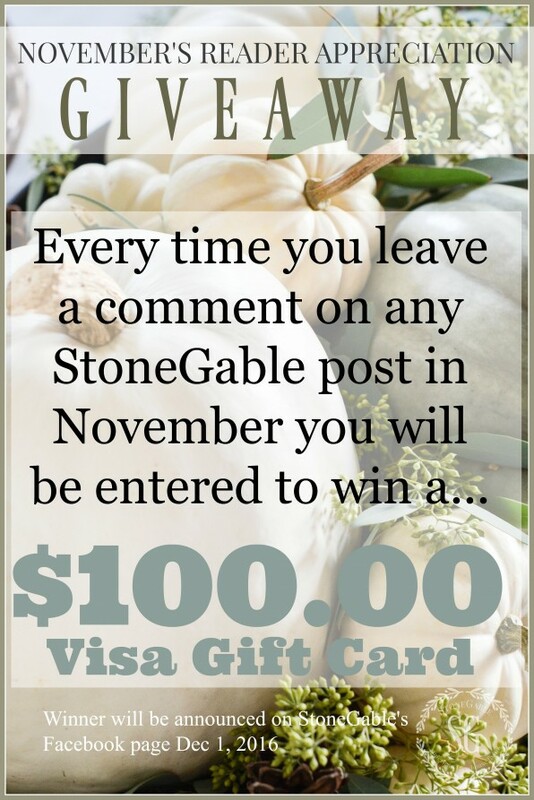 Thanks for wanting to get StoneGable back to your inbox every day! Thank you for the Thankful Cads – just what I was looking for!!!?? So many things to be thankful for. Great idea. Love this – so sweet and simple! 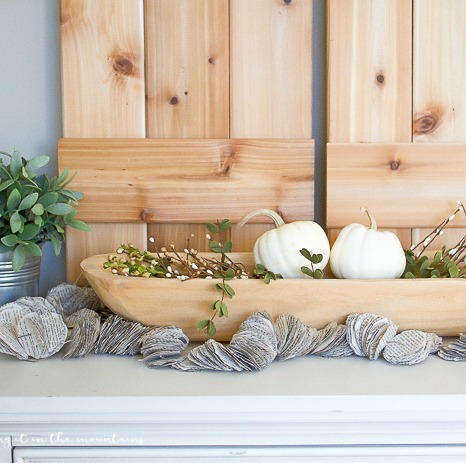 I just love 10 Minute Decorating…sometimes it just takes a little bit of time to let our creativity out. Love this! We all have so much to be thankful for! Great printable! Thank you for doing this. It’s so sweet and simple and so pretty. I love the colors. Great ideas! 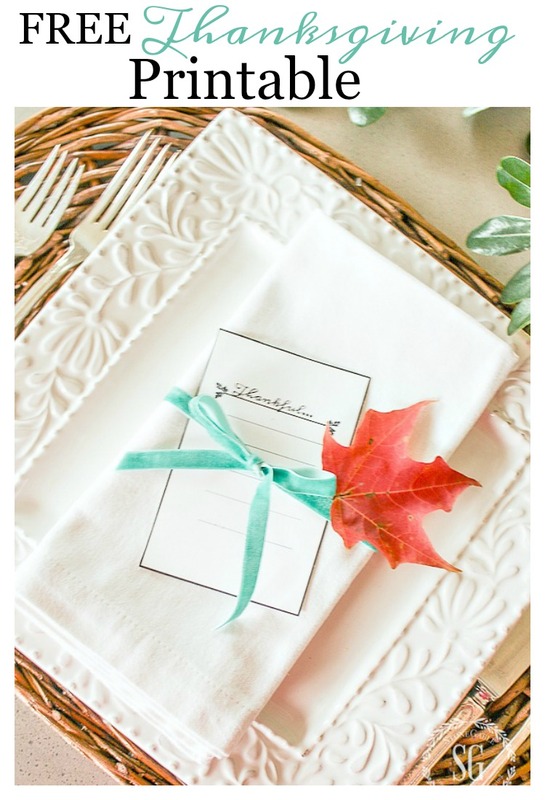 I love that velvet ribbon…beautiful table setting! Another great idea Yvonne, very simple and elegant as well. Thankful for your friendship! 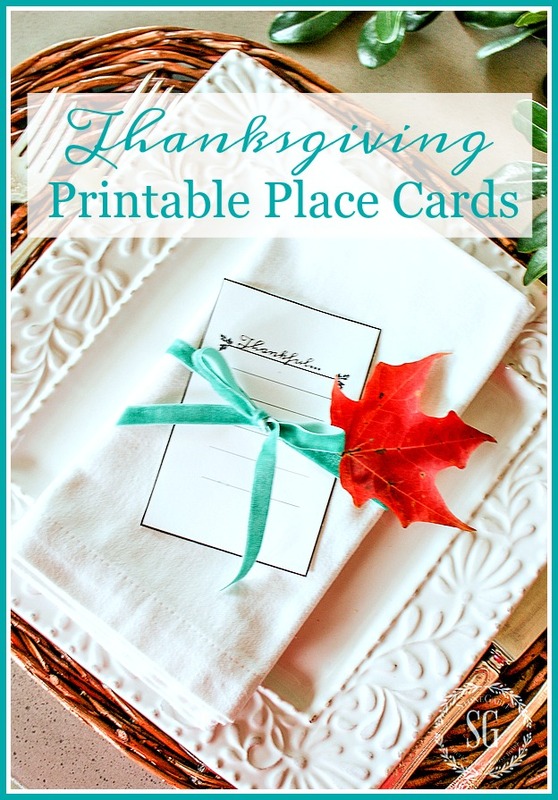 Getting card stock tomorrow to make these thankfulness cards. Thanks for the printable. Thanks for your ideas and inspiration! I’ve never used place cards at the table..seems like every family member just sits at the same spot each holiday. This year I think we will mix it up a little, so these are a great idea…thank you! Thank you Yvonne, I do the same thing you do each year. This helps me check one thing off my list for Thanksgiving dinner table setting. Simple and gracious. I am thankful for you! Thank your for the printable, it is very sweet looking. Thank you for the classy printable card. Much nicer than the post-it notes we used in the past! Thank you for the template!! Such a simple but thoughtful idea… love it! Great to have in writing! Maybe put the year too! Grateful for the personal touches you show us how to do! Just the type of printable I was looking for! So thankful for you! Thanks Dawn!!! Right back at you! Simply perfect! Love Thanksgiving and sharing the feast with family and friends. Lovely,simple and elegant as always. Love the place cards and the sentiment. thankful for them! I will make these for our Thanksgiving table. Thanks. Elegant. Thank you for sharing the template to make our own. As has been said, this is perfect for the shy ones! And to make sure there are no hesitations, I might add a pencil in that ribbon/bow (one of those short, small, “scorecard” pencils?)! Again, you always have great ideas, and this one is simple enough to not add lots of prep time! Thanks for the printable cards! 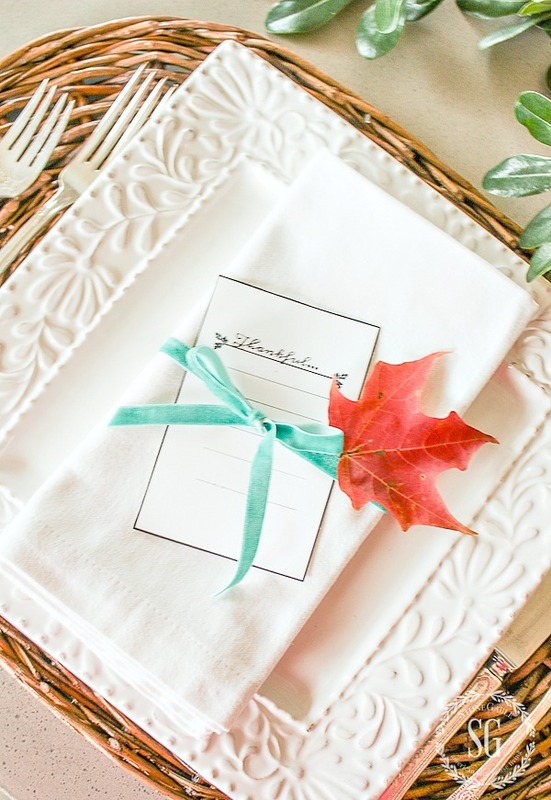 A simple and elegant addition to a Thankful table. I’m thankful for your decorating tips! My home is gradually going white! And I love it! Thanks for sharing these cards – love them. Each Thanksgiving we typically go around the table sharing what we are most thankful for each year. For some reason most of us simply settle for saying “family or friends” and don’t really elaborate on anything meaningful. I think instead of asking “what” are you thankful for this year, I might ask “why” are you thankful. Another great idea. Not all of the guys at my table like to share touchy-feely sentiments of gratitude out loud. This way they can just write them down! Great idea! 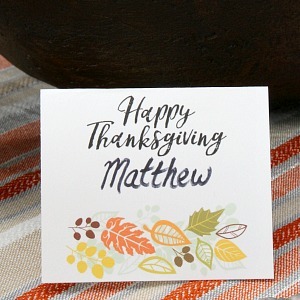 Rather than just asking each person what they are thankful for, the place cards give guests a place to write out their thankfulness. A super keepsake for the years to come! Thank you for giving us such wonderful ideas! I’m thankful for you!! Lovely idea! Thank you for the printable. Individual place-cards at each setting is such a thoughtful way for reflecting on what blessings have been bestowed to each of us. Thanks for the very nice printable place cards. Lovely way to focus on what we are really thankful for! I plan on dating each of my grands’ cards and storing them away for a future reveal! Making memories – one of my favorite things! I love ten minute decorating. This is a way to get people around the table involved. 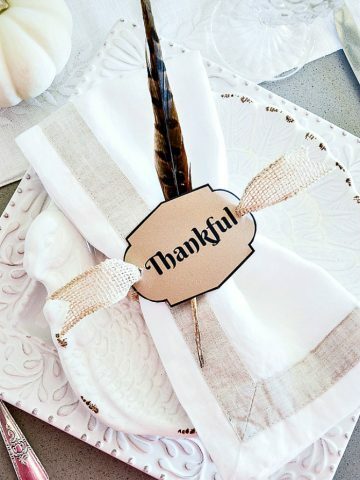 I have loved using this idea on my Thanksgiving table for years! There are a couple things I’ve done over time to accommodate my guests. To spark thoughtful inspiration, I remind friends and family, in advance, that they will be sharing one thing they are thankful for! I also provide the youngest guests a “Thankful Card” without lines so they can draw their response. We all share over dessert! Smiles, laughs, and sometimes a few tears are known to happen around the table as the “thankful” messages are read! I love the idea. I wish my printer worked to try it. Now whether my family would actually fill them out is a whole other story. Thank you also for introducing us to other bloggers we may never know if were it not for these sort of vents. I love this idea. I am trying to figure out how to use it in our huge family gathering. LOVE this Yvonne! SUCH a beautiful idea! We usually go around the table saying what we are thankful for. But sometimes I wonder if it makes guests a little uncomfortable. This is perfect! I absolutely love your place settings. I would love to know where you found the square wicker chargers? I have white square dishes and haven’t been able to find the chargers to go with them. Love your easy decorating ideas you share. Thank you for these cards! I love them! Simple, yet elegant! Love it! Thank you, Yvonne – I love the simplicity in the cards! And I think it is such a wonderful idea to take a little time to pause and reflect upon how many things we are grateful for in our lives. I am thankful for this “Thankful” place card. We are having lots of family here this Thanksgiving and we are bringing home our newly adopted daughter the week before. We are blessed. Well, Kathy you certainly have more to be thankful for than you can count! God bless all of you! What a great idea for a TG meal! Beautiful and simple! Thank you for your refreshing ideas. You are so inspiring! Thanks for sharing your blog with all of us! Love it! I wrote a comment previously on this very thing. I do a leaf cut-out for every place setting and we write what we are thankful for, read it out loud, and tie it on a tree limb positioned in a demi-john for all to read. Keeping it simple but meaningful each year. Thanks for your continuous inspiration! What a very cute idea, which reminds us all that we all have so much to be thankful for. I so enjoy seeing your wonderful ideas and fun suggestions each day. Thank you. Every one should take a long moment to remind themselves of what matters in life. Gratitude is what it is all about. Important to teach our children!! I love this idea. I usually have 25 people over for Thanksgiving dinner and this is a nice way for everyone to show how thankful they are for our wonderful lives and the wonderful people in our lives. Thank you. Simple idea but exactly what we all need to think about. A wonderful way to count our blessings. Thank you for this idea. 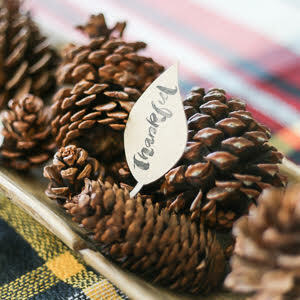 I love touches like this on the Thanksgiving table! Cute and easy! Just the way I like it. Thanks Yvonne for your inspiration with every post. What a wonderful idea for all of us to stop and count our blessings. So appreciate your blog Yvonne.